Promo Package 10 - Sailfish Extravaganza! 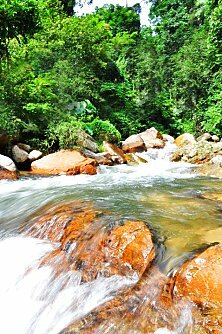 Endau-Rompin National Park is named after the Endau River in Johor and the Rompin River in Pahang. Blessed with endless natural beauty and a rare eco-system, Endau-Rompin National Park's rainforest is more than 130 million years old. It is, in fact, the world's oldest rainforest and is home to some of the world's rarest mammal species, the Sumatran Rhinoceros. Other animals you may well catch a glimpse off in Endau Rompin: black leopards, tapirs, elephants, gibbons, deer, bison and, yes, even tigers, given that sightings of tigers are reported quite regularly. Bird watchers too, will have a field day in Endau-Rompin, since it has over 250 species of birds, ranging from the world's smallest woodpecker (the size of your thumb) to various species of eagles and hornbills. 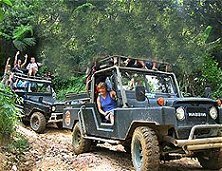 Now it's possible to experience the timelessness of this deepest, densest and most mysterious of all the jungles in Malaysia. Come face to face with Endau Rompin's original tribes, the Orang Asli, in their most remote settlement. 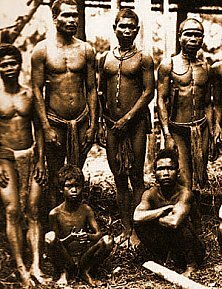 These "Original People" have inhabited Endau-Rompin's primary jungles since ancient times. Watch up close how they use their blowpipes to hunt their prey. Observe in person how they search for, prepare and then apply their traditional elixirs. Float down a crystal clear river while wearing your life-jacket and bathe in chilly-fresh natural waterfalls. Our Endau Rompin exploration is an adventure you'll remember for life! Total cost for this once-in-a-lifetime adventure is US$175 p.p..
We'll get back to you within one business day to confirm.